DAILY ENCOURAGEMENT MONDAY - HAPPINESS! There is no duty we so much underrate as the duty of being happy. - Robert Louis Stevenson. Happiness in this world, when it comes, comes incidentally. Make it the object of pursuit, and it leads us a wild-goose chase, and is never attained. Follow some other object and very possibly we may find that we have caught happiness without dreaming of it. - Nathaniel Hawthorne. A woman I know climbed on the bathroom scale after two weeks of butterless toast and chilly jogs around the park. The needle was still stuck on the number where she'd started. This struck her as typical of how things had been going lately. She was destined never to be happy. As she dressed, scowling at her tight jeans, she found $20 in her pocket. Then her sister called with a funny story. When she hurried out to the car, angry that she had to get gas, she discovered her roommate had already filled the tank for her. And this was a woman who thought she'd never be happy. Every day, it seems, we're flooded with pop-psych advice about happiness. 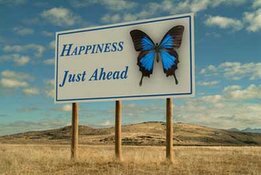 The relentless message is that there's something we're supposed to do to be happy -- make the right choices, or have the right set of beliefs about ourselves. Our Founding Fathers even wrote the pursuit of happiness into the Declaration of Independence. Coupled with this is the notion that happiness is a permanent condition. If we're not joyful all the time, we conclude there's a problem. Yet what most people experience is not a permanent state of happiness. It is something more ordinary, a mixture of what essayist Hugh Prather once called "unsolved problems, ambiguous victories and vague defeats, with few moments of clear peace." Maybe you wouldn't say yesterday was a happy day, because you had a misunderstanding with your boss. But weren't there moments of happiness, moments of clear peace? Now that you think about it, wasn't there a letter from an old friend, or a stranger who asked where you got such a great haircut? You remember having a bad day, yet those good moments occurred. Happiness is like a visitor, a genial, exotic Aunt Tilly who turns up when you least expect her, orders an extravagant round of drinks and then disappears, trailing a lingering scent of gardenias. You can't command her appearance; you can only appreciate her when she does show up. And you can't force happiness to happen, but you can make sure you are aware of it when it does. While you're walking home with a head full of problems, try to notice the sun set the windows of the city on fire. Listen to the shouts of kids playing basketball in the fading light, and feel your spirits rise, just from having paid attention. Happiness is an attitude, not a condition. It's cleaning the Venetian blinds while listening to an aria, or spending a pleasant hour organizing your closet. Happiness is your family assembled at dinner. It's in the present, not in the distant promise of a "someday when..." How much luckier we are, and how much more happiness we experience, if we can fall in love with the life we're living. Happiness is a choice. Reach out for it at the moment it appears, like a balloon drifting seaward in a bright blue sky. - Condensed from Glamour, Adair Lara, Reader's Digest. 10.Live as though you'll die tomorrow (because you will on some tomorrow) - Source Unknown. Loving Father, by the power of the Holy Spirit, fill me with the happiness of my Lord and Saviour, Jesus. I ask this in His wonderful name, and for His glory. Amen. SUNDAY SERMON ON THE BLOG – LIGHT OF THE WORLD. Whilst on holiday, and trying not to wake the wife up, I stumbled around in pitch black darkness one night trying to find the bed, to my relief Jean switched the bedside lamp on, and the room was filled with light, oh, what joy! My joy, however, is far greater at finding Jesus, who illuminates my heart on my darkest nights, illuminates my future with his coming glory, illuminates my path with his words of truth, and illuminates my hope with the dawning of each Sunday, my weekly reminder of his triumph over the grave. Whoever accepts and follows Jesus, shall have the Divine light continually shining upon them, diffusing over their soul knowledge, holiness, joy, till they are guided by it to everlasting life . Loving Father, how can I ever thank you enough for giving me the light of my life? Until my face reflects the light of your glory, Jesus will light my way. In the name of Jesus, the Light of the world, I praise and thank you. Amen. SUNDAY SERMON ON THE BLOG – LORD JESUS, COME AND EAT WITH ME. Here I am! I stand at the door and knock. If anyone hears my voice and opens the door, I will come in and eat with them, and they with me. - Revelation 3: 20. It has always fascinated me that this verse has often been cited by those calling others to conversion, when clearly in its context, it's written to lukewarm Christians needing to rekindle their love relationship to the Lord. As believers, we need to invite the Lord Jesus into our hearts, our home, and lives. It's not that He's not there; it's just that he awaits our invitation, He will not barge in. He only inhabits hearts into which He has been invited! Lord Jesus, I know you long to share your presence and fellowship with me. I know you are nearby as I draw each breath. But I confess that I am often unaware, and even sometimes unappreciative of your presence. I ask you this day to come into my heart and fill my life with your presence and comfort and power. I want my life to be lived for you and with you. I ask this in your wonderful name. Amen. DAILY ENCOURAGEMENT WEDNESDAY – WISDOM. A wise man learns by the experience of others. An ordinary man learns by his own experience. A fool learns by nobody's experience. - Source Unknown. Wisdom is the reward you get for a lifetime of listening when you would have preferred to talk. - Doug Larson. There are so many Christians who lack wisdom, but this should never be. We need to take on board the teachings of Jesus and Peter, to get this principle set resolutely in our minds, so embedded in our thinking that it becomes an established principle, and that we always depend upon God for our wisdom whenever we have trials or tribulations, even in our everyday living. Both Jesus and Peter, used this principle in their lives, and if we use them we will be victorious in our walk with Christ, so much so that even our enemies will be dumfounded and defeated. The Holy Spirit will help us to accomplish this. Wisdom is the power to see and the inclination to choose the best and highest goal, together with the surest means of attaining it. - J.I. Packer. Lacking in wisdom? Ask God. Loving Father, by the power of the Holy Spirit, help me to rely absolutely on you, that in my time of need I may ask for your wisdom. I ask this in the wonderful name of Jesus, and for His glory. Amen. DAILY ENCOURAGEMENT TUESDAY – I LACK NOTHING! The LORD is my shepherd, I lack nothing. He makes me lie down in green pastures, he leads me beside quiet waters, he refreshes my soul. He guides me along the right paths for his name's sake. Surely your goodness and love will follow me all the days of my life, and I will dwell in the house of the LORD forever. – Psalm 23. I lack nothing because the Lord is my Shepherd. He provides for me physically, financially, and spiritually. He guides me, He protects me, He refreshes me, He loves me, and I will never be lonely or homeless. Hallelujah! DAILY ENCOURAGEMENT MONDAY - VICTORY IN CHRIST! There are no victories at discount prices. - General Dwight Eisenhower. But thanks be to God! He gives us the victory through our Lord Jesus Christ. - 1 Cor 15:57. Thank you Lord! Hallelujah! You have been victorious, and because of that, we who believe and accept you as Lord and Saviour, have won the victory also! Hallelujah! This is the good news of our Lord Jesus Christ: He has died to slay death; He has risen again to bring mankind from under the empire of hell. All of this, He has done through his mere unmerited mercy and grace. He has given us the victory over sin, Satan, death, the grave, and hell! Hallelujah! February 10 began as a sad day for us in Kabale. People were commanded to come to the stadium and witness the execution. Death permeated the atmosphere. A silent crowd of about three thousand was there to watch. I had permission from the authorities to speak to the men before they died, and two of my fellow ministers were with me. They brought the men in a truck and unloaded them. They were handcuffed and their feet were chained. The firing squad stood at attention. As we walked into the center of the stadium, I was wondering what to say. How do you give the gospel to doomed men who are probably seething with rage? "Bishop, thank you for coming! I wanted to tell you. The day I was arrested, in my prison cell, I asked the Lord Jesus to come into my heart. He came in and forgave me all my sins! Heaven is now open, and there is nothing between me and my God! Please tell my wife and children that I am going to be with Jesus. Ask them to accept him into their lives as I did." The other two men told similar stories, excitedly raising their hands, which rattled their handcuffs. I felt that what I needed to do was to talk to the soldiers, not to the condemned. So I translated what the men had said into a language the soldiers understood. The military men were standing there with guns cocked and bewilderment on their faces. They were so dumbfounded that they forgot to put the hoods over the men's faces! The three faced the firing squad standing close together. They looked toward the people and began to wave, handcuffs and all. The people waved back. Then shots were fired, and the three were with Jesus. We stood in front of them, our own hearts throbbing with joy, mingled with tears. It was a day never to be forgotten. Though dead, the men spoke loudly to all of Kigezi District and beyond, so that there was an upsurge of life in Christ, which challenges death and defeats it. The next Sunday, I was preaching to a huge crowd in the home town of one of the executed men. Again, the feel of death was over the congregation. But when I gave them the testimony of their man, and how he died, there erupted a great song of praise to Jesus! Many turned to the Lord there. - Ray Stamps. WE LIVE IN VICTORY BECAUSE OF CHRIST! IF YOU ARE READING THIS, AND YOU ARE NOT A CHRISTIAN, WHY NOT GIVE SOME SERIOUS CONSIDERATION TO ACCEPTING CHRIST AS YOUR LORD AND SAVIOUR? THEN YOU TOO CAN LIVE IN VICTORY! HALLELUJAH! SUNDAY SERMON ON THE BLOG – WHO DO YOU SAY JESUS IS? "But what about you?" he asked. "Who do you say I am?" Peter answered, "God's Messiah." - Luke 9:20. A lot of people have their opinions about Jesus’ identity. The real issue, however, is what you believe about Jesus. What you decide about God’s Son means everything for you, and for those you influence. Loving Father, thank you for Jesus, who is my Lord, Saviour, friend, and older brother in your family. 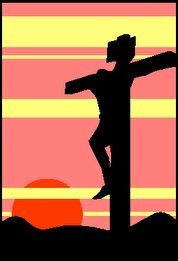 I praise you for sending him to reveal yourself to us, and I thank you for your love demonstrated by Him on the Cross. I do believe that Jesus is the Messiah, and the only Saviour who can bring freedom, pardon, cleansing, and complete salvation. In the wonderful name of Jesus I pray. Amen. DAILY ENCOURAGEMENT FRIDAY - A CHEERFUL HEART. #31. A cheerful heart is good medicine, but a crushed spirit dries up the bones. - Prov 17:22. "Because I'm not an atheist." "Well, I was brought up knowing and loving Jesus. My mom is a Christian, and my dad is a Christian, so I am a Christian." "What if your mom was a moron, and your dad was a moron. What would you be then?" She paused, and smiled. "Then," says Lucy, "I'd be an atheist." Shocked, the man looks at the shark as the huge beast closes its eyes and bows its head and says, "Thank you Lord for this food for which I am about to receive..."
When Ole quit farming, he discovered that he was the only Lutheran in his new little town of Catholics. That was okay, but the neighbors had a problem with his barbequing beef every Friday. Since they couldn't eat meat on Friday, the tempting aroma was getting the best of them. Hoping they could do something to stop this, the neighbors got together and went over to talk to Ole. "Ole," they said, "since you are the only Lutheran in this whole town and there's not a Lutheran church for many miles, we think you should join our church and become a Catholic." Ole thought about it for a minute and decided they were probably right. Ole talked to the priest, and they arranged it. The big day came and the priest had Ole kneel. He put his hand on Ole's head and said, "Ole, you were born a Lutheran, you were raised a Lutheran, and now," he said as he sprinkled some incense over Ole's head, "now you are a Catholic!" Ole was happy and the neighbors were happy. But the following Friday evening at suppertime, there was again the aroma of grilled beef coming from Ole's yard. The neighbors went to talk to him about this and as they approached the fence, they heard Ole saying to the steak: "You were born a beef, you were raised a beef", and as he sprinkled salt over the meat he said, "And NOW you are a FISH!" Charles William Eliot (1834-1926), former president of Harvard University, had a birthmark on his face that bothered him greatly. As a young man, he was told that surgeons could do nothing to remove it. Someone described that moment as "the dark hour of his soul." Eliot's mother gave him this helpful advice: "My son, it is not possible for you to get rid of that hardship... But it is possible for you, with God's help, to grow a mind and soul so big that people will forget to look at your face." - Our Daily Bread. 1. CHURCH CAR PARK - FOR MEMBERS ONLY! Trespassers will be baptised! 2. "No God - No Peace. Know God - Know Peace." 5. 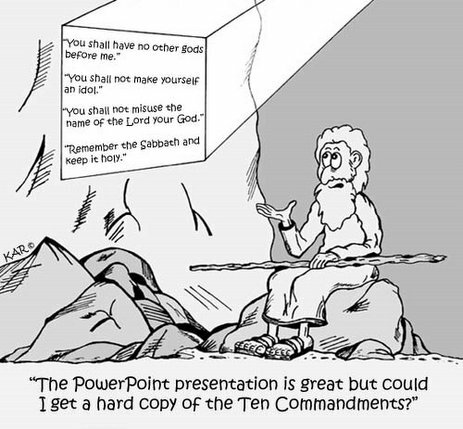 An ad for one Church has a picture of two hands holding stonetablets on which the Ten Commandments are inscribed and aheadline that reads, -"For Fast Relief, Take Two Tablets." 6. "People are like tea bags - you have to put them in hot waterbefore you know how strong they are." 7. "Come in and pray today. Beat the Christmas rush." 8. "Fight truth decay - study the Bible daily." 9. "How will you spend eternity - Smoking or Non-Smoking." 10. "Dusty Bibles lead to Dirty Lives." 11. "Come work for the Lord. The work is hard, the hours are long and the pay is low. But the retirement benefits are out of this world." 12. "It is unlikely there'll be a reduction in the wages of sin." 13. "If you're headed in the wrong direction, God allows U-turns." 14. "If you don't like the way you were born, try being born again." 15. "Looking at the way some people live, they ought to obtain eternal fire Insurance soon." 16. " A ch__ch is a church when (U R) in it. 17. "In the dark? Follow the Son." 18. "Running low on faith? Stop in for a fill-up." 19. "If you can't sleep, don't count sheep. Talk to the Shepherd." DAILY ENCOURAGEMENT THURSDAY – DEVOTION. May not a single moment of my life be spent outside the light, love, and joy of God's presence and not a moment without the entire surrender of my self as a vessel for Him to fill full of His Spirit and His love." - Andrew Murray. I am saying this for your own good, not to restrict you, but that you may live in a right way in undivided devotion to the Lord. – 1 Cor 7:35. "Holiness does not consist in mystic speculations, enthusiastic fervours, or uncommanded austerities; it consists in thinking as God things, and willing as God wills." - John Brown, Nineteenth-century Scottish theologian, quoted in J. Bridges, The Pursuit of Holiness, p. 51. Once, as an experiment, the great scientist Isaac Newton stared at the image of the sun reflected in a mirror. The brightness burned into his retina, and he suffered temporary blindness. Even after he hid for three days behind closed shutters, still the bright spot would not fade from his vision. "I used all means to divert my imagination from the sun," he writes, "But if I thought upon him I presently saw his picture though I was in the dark." If he had stared a few minutes longer, Newton might have permanently lost all vision. The chemical receptors that govern eyesight cannot withstand the full force of unfiltered sunlight. There is a parable in Isaac Newton's experiment, and it helps illustrate what the Israelites ultimately learned from the wilderness wanderings. They had attempted to live with the Lord of the Universe visibly present in their midst; but, in the end, out of all the thousands who had so gladly fled Egypt, only two survived God's Presence. If you can barely endure candlelight, how can you gaze at the sun? - Philip Yancey, Disappointment With God, Zondervan, p. 74. O great and unsearchable God, who knowest my heart, and triest all my ways; with a humble dependence upon the support of Thy Holy Spirit, I yield up myself to Thee; as Thy own reasonable sacrifice, I return to Thee Thine own. I would be for ever, unreservedly, perpetually Thine; whilst I am on earth, I would serve Thee; and may I enjoy Thee and praise Thee for ever! Amen. - Charles Spurgeon, Wycliffe Handbook of Preaching & Preachers, W. Wiersbe, p. 235. Loving Father, by the power of the Holy Spirit, fill me with the love and devotion of Jesus. I ask this in the wonderful name of Jesus. Amen. DAILY ENCOURAGEMENT WEDNESDAY – FRIENDSHIP. A small boy defined a friend as "Someone who knows all about you and likes you just the same." – Source Unknown. A British publication once offered a prize for the best definition of a friend. Among the thousands of answers received were the following: "One who multiplies joys, divides grief, and whose honesty is inviolable." "One who understands our silence." "A volume of sympathy bound in cloth." "A watch that beats true for all time and never runs down." The winning definition read: "A friend is the one who comes in when the whole world has gone out." - Bits & Pieces. 1. When you are with people, be aware of their likes and dislikes. Loving Father, by the power of the Holy Spirit, help me to be the best friend, my friends have ever had. Lord Jesus, thank you for being my friend as well as my Lord and Saviour. I ask this in your wonderful name. Amen. SUNDAY SERMON ON THE BLOG – A WORLD-WIDE FAMILY! Be devoted to one another in love. Honor one another above yourselves. - Romans 12:10. Being devoted to another in love requires that our church conversations… we're family, brothers and sisters, children of God, must be more than mere words. We must enter each others lives, getting to know one another so that we can serve, love, and bless each other. What have you done lately to get more involved in the lives of your fellow Christians? Devotion to others follows a commitment to know, and be known by them! Loving Father, thank you for giving me a world-wide family. Thank you for loving me so completely. Father I ask that you help me by the power of the Holy Spirit be more open with myself, and my time to those in your family. Give me a heart that burns to bless and be blessed by those you have made your children. I ask this in the wonderful name of Jesus. Amen. DAILY ENCOURAGEMENT FRIDAY - A CHEERFUL HEART. #30. If God didn't want us to eat animals why did he make them out of meat? Jesus. Don't leave earth without him. Eve was framed. Next time you think you're perfect... try walking on water! Press 3 for complaintsPress 4 for all others. For reservations to heaven, please enter JOHN followed by the numbers, 3 16. The office is now closed for the weekend to observe a religious holiday. If you are calling after hours and need emergency assistance, please contact your local pastor. Thank you and have a heavenly day. The caddy argued with him a bit and suggested that he instead play it safe and hit a four-iron then a wedge. The golfer was insulted and proceeded to scream and yell at the caddy on the tee telling him that he was a better golfer than that and how dare the caddy under estimate his game. So, giving in, the caddy handed the gentleman the four-wood he had asked for. He proceeded to top the ball and watched as it rolled about fifteen yards off the front of the tee. Old Abraham was a poor tailor whose shop was next door to a very upscale French restaurant. Every day at lunch time, Abraham would go out the back of his shop and eat his black bread and herring while smelling the wonderful odors coming from the restaurant's kitchen. One day, Abraham was surprised to receive an invoice from the restaurant for 'enjoyment of food'. So he went to the restaurant to point out that he had not bought anything from them. The manager said, "You're enjoying our food, so you should pay us for it." Abraham refused to pay and the restaurant sued him. At the hearing, the judge asked the restaurant to present their side of the case. The manager said, "Every day, this man comes and sits outside our kitchen and smells our food while eating his. It is clear that we are providing added value to his poor food and we deserve to be compensated for it." The judge turns to Abraham and said, "What do you have to say to that?" Abraham didn't say anything but stuck his hand in his pocket and rattled the few coinshe had inside. Abraham replied, "I'm paying for the smell of his food with the sound of my money." who can say "no" with emphasis, although all the rest of the world says "yes." - Charles Swindoll. 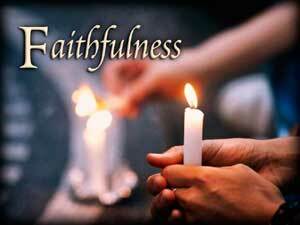 DAILY ENCOURAGEMENT THURSDAY – FAITHFULNESS. But the fruit of the Spirit is love, joy, peace, patience, kindness, goodness, faithfulness, - Gal 5:22. Norman Geisler, as a child, went to a DVBS because he was invited by some neighbor children. He went back to the same church for Sunday School classes for 400 Sundays. Each week he was faithfully picked up by a bus driver. Week after week he attended church, but never made a commitment to Christ. Finally, during his senior year in High School, after being picked up for church over 400 times, he did commit his life to Christ. What if that bus driver had given up on Geisler at 395? What if the bus driver had said, "This kid is going nowhere spiritually, why waste any more time on him?" - Max Lucado, God Came Near. But the reality for most of us is that he sends us to the bank and has us cash in the $l,000 for quarters. We go through life putting out 25 cents here and 50 cents there. Listen to the neighbor kid's troubles instead of saying, 'Get lost.' Go to a committee meeting. Give a cup of water to a shaky old man in a nursing home. Usually giving our life to Christ isn't glorious. It's done in all those little acts of love, 25 cents at a time. It would be easy to go out in a flash of glory; it's harder to live the Christian life little by little over the long haul." - Darryl Bell. Charles Spurgeon preached to thousands in London each Lord's Day, yet he started his ministry by passing out tracts and teaching a Sunday school class as a teenager. When he began to give short addresses to the Sunday school, God blessed his ministry of the Word. He was invited to preach in obscure places in the country side, and he used every opportunity to honor the Lord. He was faithful in the small things, and God trusted him with the greater things. "I am perfectly sure," he said, "that, if I had not been willing to preach to those small gatherings of people in obscure country places, I should never have had the privilege of preaching to thousands of men and women in large buildings all over the land. Remember our Lord's rule, "whosoever exalteth himself shall be abased; and he that humbleth himself shall be exalted." - W. Wiersbe, Wycliffe Handbook of Preaching & Preachers, p. 221. Loving Father, by the power of the Holy Spirit, fill me with the faithfulness of Jesus. Precious Lord Jesus my Saviour, fill me and touch me with your power, so that I can serve you by blessing those around me with your faithfulness. I ask this in your wonderful. Amen. DAILY ENCOURAGEMENT WEDNESDAY – KINDNESS. Kindness makes a person attractive. If you would win the world, melt it, do not hammer it. - Alexander Maclaren. Mamie Adams always went to a branch post office in her town because the postal employees there were friendly. She went there to buy stamps just before Christmas one year and the lines were particularly long. Someone pointed out that there was no need to wait in line because there was a stamp machine in the lobby. "I know," said Mamie, 'but the machine won't ask me about my arthritis." - Bits and Pieces. The 1992 Olympics are now history, but while they were in progress a few months back, we remembered the story of Henry Pearce of Australia, who was competing in the single scull rowing event at the 1928 Olympics. He was leading when a duck and her string of ducklings came into view up ahead. They were on a collision course and Pearce reckoned that his scull would cut the string in two and sink a few ducklings in the process, so he pulled in his oars. When the ducks passed, Pearce again bent his back to the task. There's a happy ending to the story. Pearce won. Usually, acts of sportsmanship result in defeat. Remember Leo Durocher's pronouncement, "Nice guys finish last"? It happened a couple of years ago in the marathon tandem kayak racing event at the world championships in Copenhagen. Danish paddlers were leading when their rudder was damaged in a portage. British paddlers, who were in second place, stopped to help the Danes fix it. The Danes went on to defeat the British by one second in an event that lasted nearly three hours. But there's a happy ending to this story too. According to The Wall Street Journal, the British kayakers won what many people regard as the highest honor in sports. They became the winner of the Pierre de Coubertin International Fair Play Trophy. The trophy is named for the founder of the modern Olympic Games, and it has been awarded annually for the past 28 years to people in sports who have demonstrated nobility of spirit. It is big news in Europe, but it has not been given much recognition in the United States. In the past, the trophy has gone to a Hungarian tennis player who pleaded with officials to give his opponent more time to recover from a cramp, and to a high school basketball coach who forfeited the Georgia (US) state championship after he found out that one of his players was scholastically ineligible. The first trophy went to an Italian bobsledder named Eugenio Monti for a gesture that exhibited a touch of class. In the two-man bobsled event at the 1964 Innsbruck Olympics, Monti was the leader after his final run. The only one given a chance to beat him was Tony Nash of Great Britain. As Nash and his teammate got ready for their final run, they discovered that a critical bolt on their sled had snapped at the last moment. Monti was informed of the problem and immediately took the corresponding bolt from his own sled and sent it up to Nash. Nash fixed his sled, came hurtling down the course to set a record and won the gold medal. - Bits & Pieces. Somerset Maughan's mother was an extraordinarily beautiful woman married to an extraordinarily ugly man. When a family friend once asked how such a beautiful woman could have married such an ugly man, she replied, "He has never once hurt my feelings." - - Source Unknown. Loving Father, by the power of the Holy Spirit, fill me with the kindness of Jesus. Precious Lord Jesus my Saviour, fill me and touch me with your kindness, so that I can serve you by blessing those around me with your kindness. I ask this in your wonderful. Amen. It cannot be emphasized too strongly or too often that this great nation was founded, not by religionists, but by Christians, not on religions, but on the gospel of Jesus Christ! - Patrick Henry. Greater love has no one than this, that someone lays down his life for his friends. - John 15:13. We here in Australia celebrate with our friends in America, the 4th of July celebrations. America is a great country and having won their independence and freedom, they in turn, have helped many countries to receive the same independence and freedom that they share. America, land of the free, we salute you! God Bless America! For if while we were enemies we were reconciled to God by the death of his Son, much more, now that we are reconciled, shall we be saved by his life. - Rom 5:10. When nations are engaged in deadly strife, it is common for patriots to declare that he who gives his life for defense of his country may be certain of a home in heaven because of having made the supreme sacrifice. This teaching is in accord with the principles of the Moslem religion and not with true Christianity. Mahomet promised his fanatical followers a place in Paradise if they died for the faith in conflict with the "infidels" who rejected his teachings. 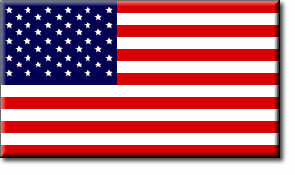 Patriotism is a virtue of which any man may well be proud. But patriotism, praiseworthy as it is from the human standpoint, will never fit the soul for the presence of God. It can never wash away the guilt of sin. The testimony of Edith Cavell, the brave British nurse who was killed by the Germans during the former world war, is well worth considering in this connection.This noble woman was born in Swardeston, Norfold, on December 4, 1865. She entered the London Hospital for nurses' training in 1895. In 1907 she was appointed first matron of the Berkendael Medical Institute at Brussels, Belgium. This became the Red Cross Hospital in Belgium at the outbreak of the conflict in 1914. From August of that year, until August, 1915, Nurse Cavell helped to care for wounded French, Belgian, English and German soldiers alike. She ministered faithfully even to those who had fallen while fighting against her own nation. Naturally, her sympathies were with the Allies, and in cooperation with the efforts of Prince Reginald de Croy, she aided many derelict English and French soldiers who had fled from the Germans. These escaped by "underground" methods to the Dutch frontier, where, with the aid of guides, they were conveyed across to Britain.When some of these fugitives were traced to her house in Brussels, she was immediately arrested and after a court-martial was sentenced to face a firing-squad. All her kindness to the German wounded was forgotten. Her captors considered her a spy and treated her accordingly.Just before the bandage was placed over her eyes, as she stood fearlessly facing the solders who were about to take her life, she gave a last message to the world. "I am glad," she said, "to die for my country. But as I stand here I realize as never before that patriotism is not enough." Then she went on to give a clear, definite testimony to her personal faith in the Lord Jesus Christ and her assurance of salvation, not through laying down her life for others, but because He laid down His life for her. In perfect composure, she submitted to the bandaging of her eyes and, in a few moments fell, pierced by many German bullets. Her words, patriotism is not enough! Have spoken loudly to many in the years that have gone since she died a martyr to her convictions. "What more is needed?" you may ask. The answer is "Christ!" It is through faith in Him alone that the soul is saved and heaven assured. - H.A. Ironside, Illustrations of Bible Truth, Moody Press, 1945, pp. 60-61. Lord Jesus, thou who art the way, the truth, and the life; hear us as we pray for the truth that shall make all free. Teach us that liberty is not only to be loved but also to be lived. Liberty is too precious a thing to be buried in books. It costs too much to be hoarded. Help us see that our liberty is not the right to do as we please, but the opportunity to please to do what is right. - Peter Marshall, Before the U.S. Senate. DAILY ENCOURAGEMENT TUESDAY - DIVINE PROVISION. Missionary statesman Hudson Taylor had complete trust in God's faithfulness. In his journal he wrote: Our heavenly Father is a very experienced One. He knows very well that His children wake up with a good appetite every morning... He sustained 3 million Israelites in the wilderness for 40 years. We do not expect He will send 3 million missionaries to China; but if He did, He would have ample means to sustain them all... Depend on it, God's work done in God's way will never lack God's supply. - Our Daily Bread. Then Jesus declared, "I am the bread of life. Whoever comes to me will never go hungry, and whoever believes in me will never be thirsty. - John 6:35. We all crave food at regular intervals during the day, and food occupies our thoughts and fills up our activities. But deep in our soul is a hunger, a soul hunger that cannot be filled by food, drink, or chemicals. This hunger was the desire built into us by our Creator, placed there when He knitted us together in our Mother's womb. This hunger and thirst can only be satiated by Jesus. There are three huge gates that lead into the Cathedral of Milan. Over one gate there is an inscription in marble under a beautiful flower bouquet that says, "The things that please are temporary." Over the second gate, there is a cross with this inscription: "The things that disturb us are temporary." However, over the central gate, there is a big inscription saying, "Eternal are the important ones." - Source Unknown. Thirsting after our Lord means enjoying the gifts and graces of the Holy Spirit, which progress from Jesus Christ our ever flowing fountain, who dwells in every believing heart. There is no eternal life without the Spirit; no Spirit without Christ; and no Christ to give the Spirit, without dwelling in our hearts. Will never thirst - Will never (provided he continue to drink thereof) be miserable, dissatisfied, without refreshment. If ever that thirst returns, it will be the fault of the man, not the water. But the water that I shall give him - The spirit of faith working by love, shall become in him - An inward living principle, a fountain - Not barely a well, which is soon exhausted, springing up into everlasting life - Which is a confluence, or rather an ocean of streams arising from this fountain. – John Wesley. Jesus is the food that gives us life, and preserves us from death. In Him we will thirst no more, we will be rivers of living water. Hallelujah! Praise His wonderful name! Loving Father, by the power of the Holy Spirit, fill me with Jesus. Give me today, my Daily Bread, that I may find life in all its completeness. Precious Lord Jesus my Saviour, fill me and touch me with your presence, so that I can serve you by blessing those around me with your grace. I ask this in the mighty name of Jesus. Amen. DAILY ENCOURAGEMENT MONDAY – RESPONSIBILITY. Each of you should test your own actions. Then you can take pride in yourself, without comparing yourself to somebody else, for each of you should carry your own load. - Gal 6:4-5. James Alexander Thom, on the fear of responsibility: Have you ever had to paint some roof trim, high up? You get halfway up that 36-foot extension ladder and you start wondering about the ladder, its footing and your body weight. You stop and hug the ladder, looking neither up nor down. Your left leg begins a ridiculous but uncontrollable shuddering. At length you conquer that particular rung and inch your way to the next, then the next. Finally you're at the top, clinging for your life. How can you take one hand off the ladder to use the paintbrush? But you do. Tight as a fiddle you begin. The sky is clear. The sun is nice. The thirsty wood soaks up the paint. You whistle and think positive thoughts and do a good job and forget about the height. In 1 Samuel 17 we have the thrilling story of David, the modest shepherd boy who slew Goliath, the arrogant giant of Gath. The drama of that event so occupies our attention that the spiritual lessons contained in the more minute details may escape our notice. Today, therefore, I'd like to consider the importance of the expression "five smooth stones." Why more than one stone? Wasn't David a man of faith? Did he doubt that God would give him perfect timing and aim as he used his trusty sling to take on the enemy of the Lord? (Certainly he needed only a single small pebble to accomplish his mission. Why did he choose "smooth stones"? Well, you can shoot much more accurately with the proper ammunition. He had faith, but he also used sanctified common sense. 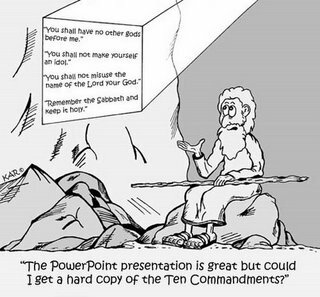 He didn't foolishly say, "The Lord is going to do it anyway, so I'll just pick up any old jagged rocks." No, he recognized human responsibility as well as Divine providence and selected shiny, round stones that would speed straight to the mark. - Our Daily Bread. The divine "scheme of things," as Christianity understands it, is at once extremely elastic and extremely rigid. It is elastic, in that it includes a large measure of liberty for the creature; it is rigid in that it includes the proviso that, however created beings choose to behave, they must accept responsibility of their own actions and endure the consequences. - Dorothy L. Sayer. Loving Father, thank you for your daily grace and presence in my life, through the precious blood of Jesus my Lord and Saviour. Help me by the power of the holy Spirit to be responsible in every situation. I ask this in the wonderful and majestic Name of Jesus. Amen. SUNDAY SERMON ON THE BLOG – PRAYER. In the morning, LORD, you hear my voice; in the morning I lay my requests before you and wait expectantly. - Psalm 5:3. Prayer is more than asking. Prayer is more than praising. Prayer is more than thanking. Prayer is more than requesting or interceding or kneeling or humbling ourselves. Prayer is expecting that God wants us there, expecting that God hears us, and expecting that God will meet us in our prayer time and do what is best for us and those we love. Loving Father, thank you for meeting us in this prayer time. I know that you hear us and care about what we share with you. Thank you for paying attention to us and accepting us as your precious children. We thank you, in the wonderful name of Jesus'.Amen.